To ensure a consistent approach and delivery of BOAT Programs, the NASBLA Instructor Credentialing Program (NICP) has been designed to meet the specific needs of the member agencies and our partners as recommended by NASBLA’s BOAT Advisory Board. The NICP includes selection, credentialing, and retention phases for NASBLA credentialed instructors as well as an emphasis on training and professional development opportunities. Evaluations and assessments will be conducted on a regular basis to ensure that the minimum standards for credentialing are being sustained. 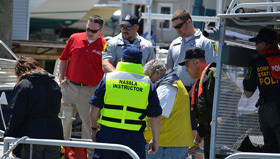 Effective training of marine enforcement officers and emergency responders is essential to NASBLA’s goal to establish, coordinate and maintain the availability of a high quality instructor cadre across multiple course curricula. Instructor credentialing is an essential process to ensure consistent, high quality delivery of training in order to provide maximum benefit to the personnel who receive the training and the agencies they represent.